Trucks! I know, I know, trucks for Christmas, right? We all need to stretch our wings and make a little something for the guys, and this tag is an answer to that. 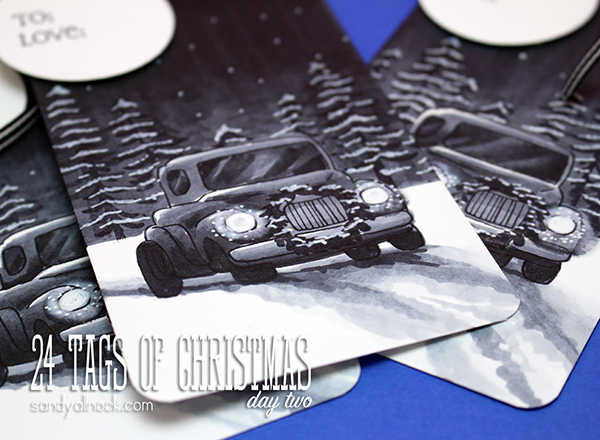 Wouldn’t these tags look sharp on a wrapped Xbox under the tree? I had colored this image a while back during travel, and had instagrammed the work in progress – that was met with a LOT of positive response, along with some requests for a tutorial. Happy to oblige! This version in the video is a little simpler than the one I colored while travelling – just to help if you’re trying to CASE this for a card or tag of your own. December is passing by fast, so we need to get ‘er done! Enjoy the video below – and if you can’t see it there, watch it in HD on YouTube by clicking HERE. Below are a few closeups…. Don’t forget your opportunities to win – commenting here and on YouTube, sharing on social media wherever you do that kind of thing. Be sure to tag me if you can….don’t email, as I get hundreds—-it’s better to leave a comment here on the blog so I can count it toward your entries. 🙂 Good luck! PS The concert last night was wonderful! Opera, violin duets, and reflections on the Christmas season…I was asked to read one, that’s what I had to get all gussied up for. Pics on Instagram! 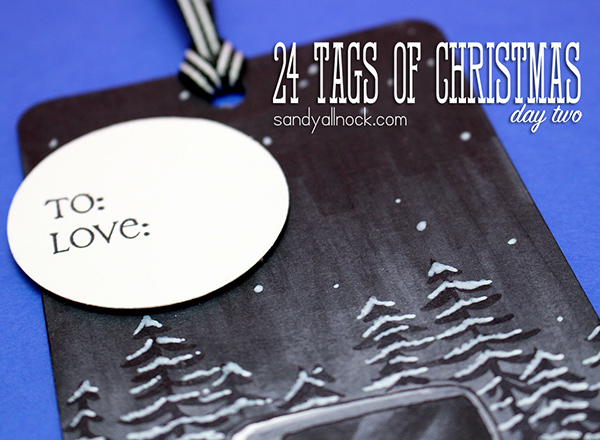 Before you go – I have another tag for you today that’s not part of the 24 tags….and it’s got GLITTER! Ack, right? Go over to the CLASSroom to see! Seriously! I am all about color and yet you just created a black and white scene that I absolutely LOVE! The road, the headlights, the snow on the trees. You are amazingly talented Sandy! Love everything you do but your “black and whites” are stunning. You make it look so easy. Amazing!! Love, love, love the techniques. Thank you so much for sharing your wonderful talents! This was awesome to watch unfold before my eyes, I was a little skeptical at first, but you always make “your hotmess” beautiful in the end. Of all the tags in the 24 days series, I have to say this is my favorite, but my all time favorite coloring of yours is the Beautiful Peonies, breathtaking. TFS all of your tips and knowledge they are so appreciated. Ok…I am speechless…I’ve watched this video twice and I’m still blown away by your amazing talent! My husband LOVES this tag! Practice, practice, practice – and maybe I’ll be able to do as good a job as you by next Christmas! The monotone is just incredible. Congratulations on being spotlighted by Copics! Cool tag – very real looking! Again another WOW moment… I really like this truck!! For ME..LOL..super cool..wish I was in the truck…Thanks Sandy! You are just beyond amazing. So much depth created with a few markers. That really portrays your knowledge of lights and how to make the shades work for you. These are my favorite. Wow these are stunning…one just wants to frame them and give away a gifts. What beautiful tags for the guys. 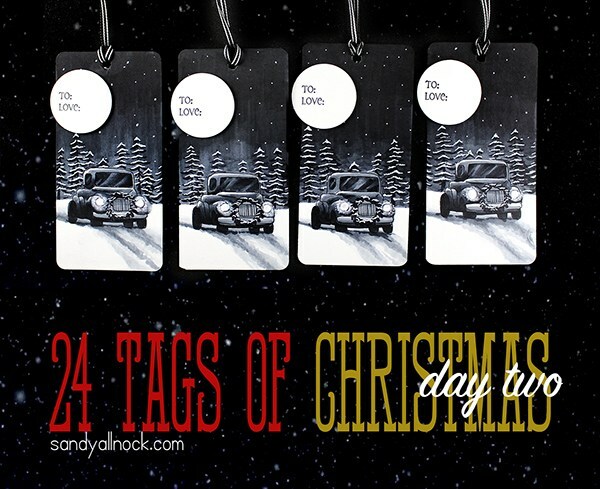 These tags are just amazing – very very special! LOVE this black and white masculine tag! It looks so ALIVE! WOW! I really love the greyscale! I have a question, I notice on several of your videos (maybe you have answered this before?) that you use wash tape to mark some of the Copics that you are using…do you do this to identify the markers that you are using on a particular project or to identify your grey tones…?? I am so curious as to your thought process LOL. Thank you again for sharing your talent! LOL, but you did give me a great idea! I think that I i will use washi tape to mark my grey tones, my go to skin tones and possibly my hair shades. Thank you for the inspiration! I love the trucks in the night time. The snow looks so real!!! Awesome!!!! What a great set of masculine tags! 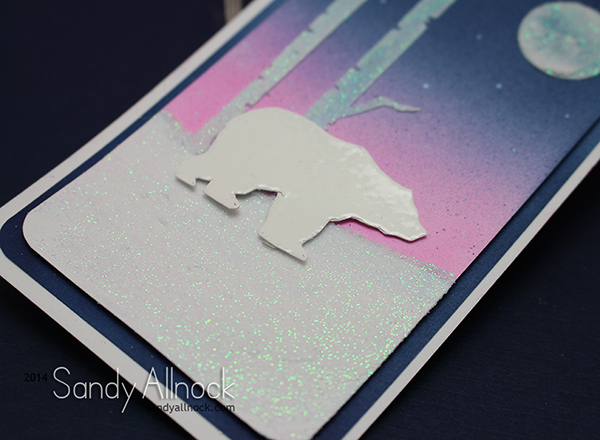 And, a glitterery card from you… who would’ve thunk it?! A-freakin-mazing!!!! This tag is completely awesome! These are wonderful. I love the black and white. These trucks are absolutely fabulous! I love that it is colored in all gray. Totally unbelievable to see the creation of these gorgeous tags. My parents have an old Model A, & several other old cars, they go on trips with the old car clubs, so I am drawn to these images. I still cannot believe how you were able to make the roadway with snow. Beautiful! Wow! That tag is amazing! I love how your images look so real and in black and white too!!! These are amazing. I watched the video on you tube but I had to come here and watch again and tell you how much I love these tags. Thank you for sharing your great talents. Fantastic! You’re so very talented. I just love black and white and these are just perfect! Thank you for all the work you do and share. Loving these masculine tags, especially the fact that you are using the greys. This is positively stunning in black & white!!!! Oh! You make it look so easy. I love the masculine theme! Sweet! You do a great job with values!